When we moved into the condo, my uncle and his family sent this funny little man from Japan as a housewarming gift. As I read my uncle’s instructions (several times – they were in German) I found out the man was not just a statue, but a special wishing doll named Daruma. Here’s how it works: you make a wish and paint the pupil on his right eye. He sits around the house reminding you of your wish until it comes true – then you paint the other eye. We’re still trying to think of the perfect wish. Being practical, I immediately wondered if I could use a dry erase marker and wipe him clean for next year. But in this case, perhaps it’s best to stick with tradition. For more information, check out the Wikipedia article about Daruma dolls. They have a variety of uses. For children, Daruma dolls are frequently given as banks, where they get to fill in the second eye after filling the daruma with money. 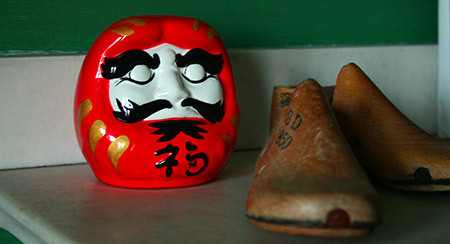 the Daruma is then broken in a similar purification ritual as described in the Wiki entry. I also don’t know what the article is talking about owning only one Daruma at a time. That’s just plain wrong. I bough daruma’s doll. But got a painted already a right eye. Do you think the wishing still be granted?